High-volume throughput and part-processing versatility. The HYPER QUADREX Series is designed for high volume productivity, featuring simultaneous first and second operations or balanced cutting/milling through its first/second spindles and upper/lower turrets. 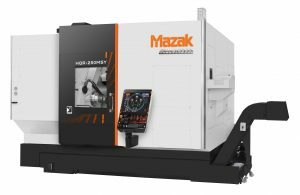 The HYPER QUADREX machine configuration directly results in part-processing versatility, and reduced cycle times among various operations – ranging from chuck work to the machining of large diameter bar stock. Advanced automation options enable unattended, continuous operation by combining these machines with a bar feeder and workpiece unloader for bar work, or with a robot loader for chuck work. The superior designs of the HYPER QUARDREX machines ensure high productivity within a compact floor plan. Fast and easy programming for using all machine spindles and turrets in part processing. 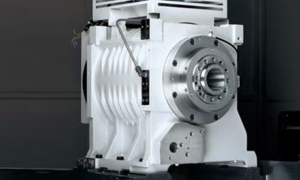 With high-speed or high-torque available integral motor spindle types, the machine allows users to match spindle performance to their specific machining requirements with the proper speeds and power. The machine provides fast, efficient and versatile machining of a wide variety of materials from steels to nonferrous metals. Vibration is minimized during high-speed operation to ensure exceptional surface finish and maximum tool life. 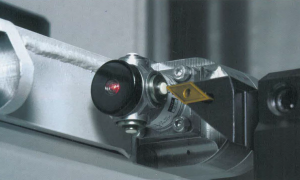 Each machine features a standard tool eye that automatically measures tool-tip positions to detect for tool wear and damage, ensuring part accuracy during continuous machining operations. Compensation can be automatically calculated with inspection for tool breakage. In addition, since tool setup is done by simply bringing the tool tip into contact with the Tool Eye, tool setup time is considerably reduced. Chuck-type workpieces are processed 1.5 times faster, resulting in 40% of the time used when compared to conventional 4-Axis lathes. 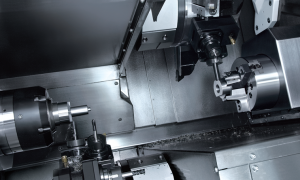 Tool interface is no longer an issue, unlike traditional 4-axis turning machines.